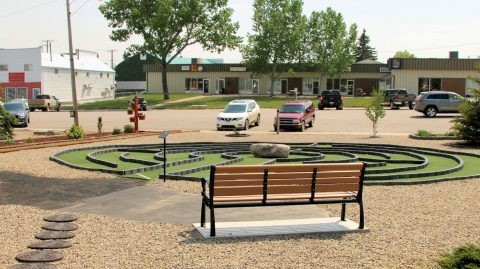 Cabri’s Community Garden is located on Centre Street. 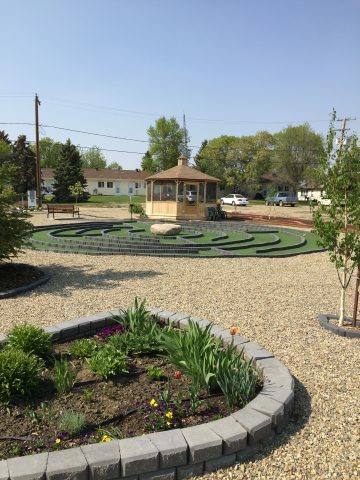 The garden features a labyrinth that is well-traveled by meditative adults and adventurous children alike! A welcoming gazebo filled with comfortable chairs offers a place to relax and visit. Picnic tables and a bench are located in the garden as well. Cabri’s town clock stands proudly there too. Throughout spring, summer, and fall the perennial bed always features something blooming and the native flower bed in the upper corner showcases local plants found in the area. Be sure to see the native bed in the spring when red and white tulips bloom in the shape of the Canada flag! Tulips and annual flowers surround the outer edge of the labyrinth, and a wide variety of plants circle the gazebo also. Believe it or not, the Community Garden space was once an empty lot! 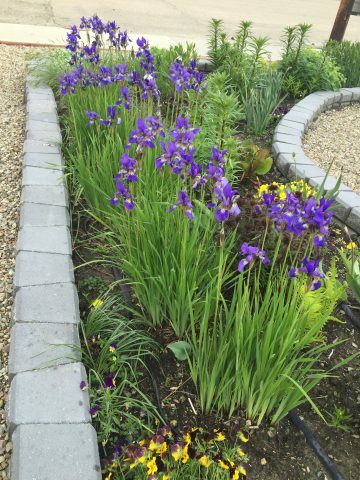 The Garden transformation project began in the spring of 2013. 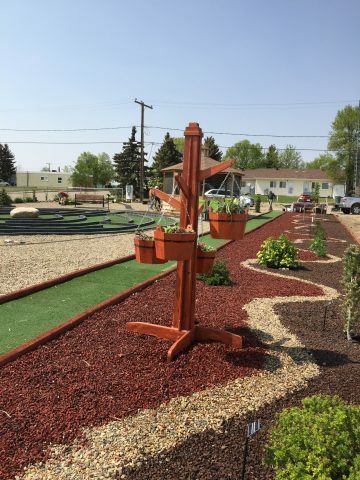 Individuals, families, organizations, and businesses from Cabri and area worked together to make the garden a reality by volunteering their time and labor, giving/purchasing plants and trees, loaning equipment, and making donations. The garden has seen many enhancements over the years thanks to ongoing support from the community. 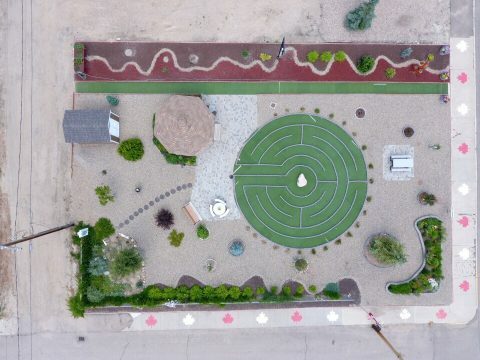 The Garden has hosted various events over the years including a flag raising ceremony honouring Saskatchewan’s flag, a celebration for Canada’s 150th birthday, welcoming horticultural tour groups, etc. 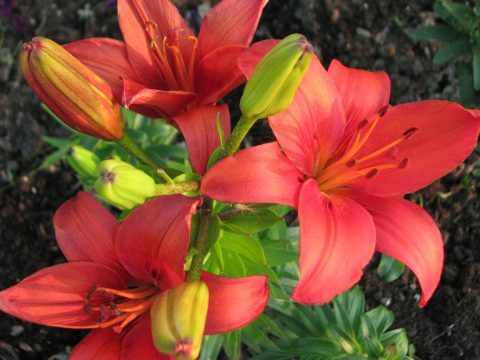 The Garden is still vibrant in the winter time too! Every year the first Sunday in December is the beautiful Light Up the Trees event which is always well-attended by families! 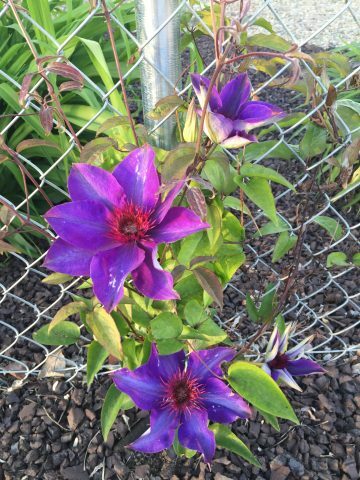 Residents of the area and visitors alike are invited to stop by and check out Cabri’s Community Garden. It is well worth the visit!